The opioid epidemic continues to consume the United States. In 2016, more than 42,000 people died of opioid overdoses and recent estimates put the cost of the opioid epidemic in excess of $500 billion annually. States are addressing this widespread tragedy at its root cause: opioid prescribing. However, the whos, whats, whys and hows of these key strategies vary widely across the country. 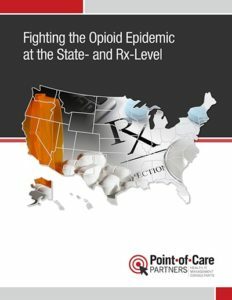 The Fighting the Opioid Epidemic at the State- and Rx-Level report was designed to provide health care executives, law enforcement and government leaders a unified view of state and federal efforts to combat the opioid crisis at the prescribing level. Updated through July 2018, it focuses on the range of state responses to the opioid epidemic. The Fighting the Opioid Epidemic at the State- and Rx-Level report is a helpful companion piece to the ePrescribing State Law On-Demand research brief. When purchased together, the Opioid report is discounted to $495. The Fighting the Opioid Epidemic at the State- and Rx-Level report can also be purchased at the discounted $495 price for customers currently subscribed to the ePrescribing State Law Review. Contact us to purchase. The 39-page report includes details of state responses to opioid prescribing organized around three main trends: 1) prescribing, 2) curbing fraud and abuse, and 3) preventing and treating addiction. The analyses are supplemented with 12 figures, including state maps indicating required consultation of Prescription Drug Monitoring Programs (PDMPs) by prescribers and dispensers. A third map focuses on states that have mandated electronic prescribing of controlled substances (EPCS) or proposed doing so. Specific details are summarized in two Appendices. 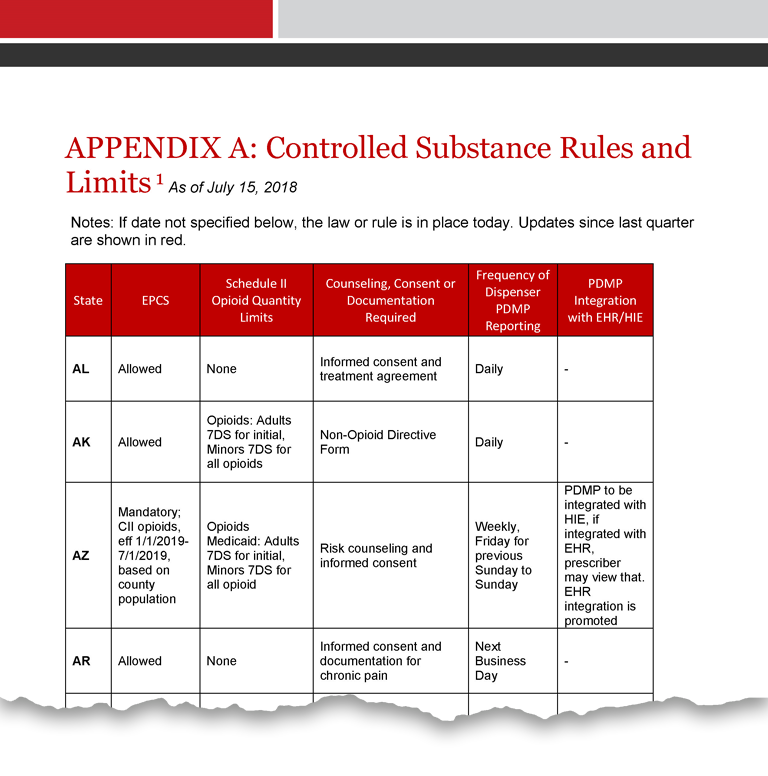 Appendix A provides a state-by-state overview of controlled substance rules and limits. Appendix B highlights controlled substance mid-level prescribing authorities. In total, as described throughout this report, thirteen different mandates are being used across states to combat the opioid crisis, all of which are detailed in the report. The states with the highest-observed drug overdose death rates have implemented and proposed the most measures. Those states and their efforts are highlighted. A majority have enacted—or are considering—legislation requiring prescribers to consult PDMPs before prescribing. The report contains a table of which states are doing what. Several states have mandates in place that require prescribers to submit controlled substances via EPCS while others have proposed EPCS mandates in the last few weeks. The components of these mandates are highlighted in the report. An increasing number of states are limiting who can prescribe opioids and Schedule II narcotics as well as fill quantities in addition to requiring additional data such as diagnosis. Which states are doing what is articulated in the report. In another key trend, states are mandating that providers counsel and provide more education to patients around opioid prescribing. Want to learn more? Click here for a report preview. POCP’s Regulatory Resource Center also can do a deep dive on this and other state prescribing-related issues. For more information, contact rrc@pocp.com. This new, first-of-its-kind report from Point-of-Care Partners (POCP) explains overarching trends across the states on opioid prescribing and provides the latest summary details on a state-by-state basis. The analyses are based on original research and data collection by Point of Care Partners (POCP) in July 2018 by POCP’s Regulatory Research Center. The Report’s content also was informed by POCP’s nationally recognized expertise in electronic prescribing, health information technology and eMedication management. To view other POCP reports, click here.